Back in December 2007, we quite heavily criticised the paper of Douglass et al (in press at IJoC) which purported to show that models and data were inconsistent when it came to the trends in the tropical troposphere. There were two strands to our critique: i) that the statistical test they used was not appropriate and ii) that they did not acknowledge the true structural uncertainty in the observations. Most subsequent discussion has been related to the statistical issue, but the second point is perhaps more important. Even when Douglass et al was written, those authors were aware that there were serious biases in the radiosonde data (they had been reported in Sherwood et al, 2005 and elsewhere), and that there were multiple attempts to objectively address the problems and to come up with more homogeneous analyses. We mentioned the RAOBCORE project at the time and noted the big difference using their version 1.4 vs 1.2 made to the comparison (a difference nowhere mentioned in Douglass et al’s original accepted paper which only reported on v1.2 despite them being aware of the issue). However, there are at least three new papers in press that independently tackle the issue, and their results go a long towards addressing the problems. The papers in question (all in press at the Journal of Climate) are from Lanzante and Free, Sherwood et al and Haimberger et al. Note that there are additionally at least two other papers on the way which are relevant but which are not yet publicly available – we’ll mention them when they appear. First off, Lanzante and Free do an excellent job in really pinning down the biases (compared to satellites and models) of the standard homogenised radiosonde networks (RATPAC2 and HadAT2). These biases undoubtedly exist and the issue is to work out whether they are due to instrumental problems, sampling issues, errors in model physics or errors in model forcings (or all of the above!). In the global mean, there isn’t much of an issue for the mid-troposphere – the models and data track each other when you expect they would (the long term trends or after volcanoes, and don’t where you expect them not to, such as during La Niña/El Niño events which occur at different times in models and observations). Similarly the lower stratospheric trends and variability is reasonably matched except for the post-Pinatubo period where the sondes cool uniformly more than the models – possibly due to underestimation of the stratospheric ozone trend. However, the big discrepancies are in the tropics. The errors due to the homogenisation procedures are unfortunately large (as also attested to by McCarthy et al (2008)) and could (according to L&F) be responsible for all of the difference from the moist adiabat (the expected amplification with height). This is because the distribution of sondes in the tropics is very sparse, there have been a lot of changes of instrumentation, and the known biases (related to solar heating for instance, giving warm biases during daylight) aren’t necessarily easy to correct. Sherwood et al, notably, discuss how to minimise three specific problems in any homogenisation procedure: missing change points, incorrectly detecting change points and problems with ‘bad neighbours’. The differences from the expected profile are all towards cooling – and this leads to even more cooling in the stratosphere than the models predict as well as cooling in the troposphere (the bias most often remarked upon). The fact that the bias is the same sign throughout the column (despite the very different physics in each region) is a clue that this is unlikely to be real. Thus different groups have been trying to use different techniques to improve the homogenisation. Haimberger et al propose two approaches – one is to use the reanalysis datasets (ERA-40) as a guide, and a second is an objective way of looking for break points in the individual timeseries. The first approach (adopted in the RAOBCORE products) can bring new information because the reanalysis assimilates a lot more data than just the sondes temperatures – satellite products for water vapour, temperature, winds etc. – and tries to come up with a consistent picture. Unfortunately, the reanalysis itself has jumps as new sources of data (new satellites for instance) get assimilated, and so there are limits to how much use it is – and since they assimilate MSU data as well, the results aren’t necessarily independent of the uncertain MSU products either. The second approach is denoted RICH (Radiosonde Innovation Composite Homogenization). This uses a similar method as HadAT2 to detect change points but uses the RAOBCORE product as a background. This works because the problems that arise in the reanalysis are not going to be correlated to the problems in an individual sonde. As can be seen this produces significantly different results from the standard products (like HadAT). RICH also seems more physically consistent than RAOBCORE, particularly in the lower troposphere. The results from RICH (shown here for the individual locations), show up quite dramatically why the tropics have much greater uncertainty than the Northern Hemisphere mid-latitudes. The number and density of stations there is dramatically less. Sherwood et al (pdf) take a different, iterative, approach that involves using the wind shear measurements (taken at the same time as the temperatures) as a consistency check. These measurements can be linked (via the thermal wind equation to temperature gradients) but are not subject to the same problems in instrumentation. They specifically avoid using the satellite data in the process, so that this can serve as a check on the final product. So what do these authors find? Each of the different, and independent, methodologies ends up finding pretty much the same thing. If you do a better job on the homogenisation, you end up with answers closer to the expected moist adiabatic amplification of the trend with height. It bears stating again that the expected amplification has nothing to do with the greenhouse effect – it is just a function of the surface warming. Note also that this result was nowhere built in to the analyses and so to find that the most consistent readings produce just that is a validation of all the approaches. To conclude, the structural uncertainty in the radiosonde data is large, and while these attempts to improve the homogenisation are a step in the right direction, the degree of adjustment is a concern. The bottom line is that the observations may well be closer to the model data than preliminary analyses suggested but that the structural uncertainty remains high. Coming to dramatic conclusions based on any of this remains unwise. In Allen & Sherwood I don’t see surface warming deduced from thermal winds? Are they comparing apples and oranges? Well, current state of the whole Climatology included. So I take it you don’t agree that Ocean heat content is a much better measure of warming–or lack of? Basically, it is because it is a really good idea. Gavin, I read it through and I remain unconvinced. Given the very sad state of surface stations and UHI effects, the ocean heat is a cleaner way of getting at the net energy flow/loss into the system. Bob B: I think everyone is in violent agreement that monitoring ocean heat content is a good idea. Where I think you disagree with many people in the field is whether we currently have the ability to measure that uptake with anything near the precision and coverage we get with surface stations. Of course, I think that most climate scientists do not think our surface stations are in a “very sad state”. 1) A better understanding of how the ocean will act in the future as a heat sink. 3) It will presumably be anticorrelated with year to year variations in global surface temperature that we see, especially from El Ninos and La Ninas, which will be nice whenever we have a cool year and the deniers cry out “global warming stopped!”. It is not the topic, I apologize. But concerning the ocean heat uptake, have you some confidence in altimetric sea level measurement? I heard that there were some calibration problems but I’m not sure. If we can also have confidence in GRACE measurements, which give us the ocean mass increasing (melting and …), is it possible to find a best estimation of OHC than with XBT, ARGO, …? So, “real scientists” will eventually “resolve” inconvenient discrepancy in radiosonde data. But satellite data, both RSS and UAH, still stubbornly refuse to show greenhouse fingerprint, in accordance with old, “incorrect” radiosonde data. What kind of intervention in satellite data sets will be needed in order to convince those data to respect the real science? No, you are wrong, RSS is consistent with models only if we look at global trends, but RSS trend for tropical “hot-spot” is out of 2 standard deviations limit of the model mean, just like UAH and all “uncorrected” radiosonde data sets. Gavin- Here is Climate Science’s follow up to your continued refusal to update the GISS model comparison with the ocean heat content change data – http://climatesci.org/2008/05/26/challenge-to-real-climate-on-their-prediction-of-global-warming/. On your further claim that the RSS data is consistent with the models, please provide us with GISS plots of the tropospheric and lower stratospheric layer average temperature data trends (corresponding to their weighting functions TLS; TTS; TMT and TLT). The RSS global average data can be viewed in Figure 7 in http://www.remss.com/msu/msu_data_description.html. Can the GISS model, for example, replicate the recent cooling of the global troposphere? #8 Pascal, the confidence climatologists have in altimetric sea level measurement will depend on whether their measurements are coincident with what they expect or not. Same as with radiosondes. Gavin, you are right when you say that the trend of the tropospheric temperatures as measured from satellites is higher than the one shown by the radiosondes. However, the warming trends are still lower than the surface temperature trends, and also quite surprisingly, the trends in the tropical troposphere are less warming than the trends in the extratropical troposphere. But all the models show more warming in the tropical troposphere than both in the tropical surface and in the rest of the troposphere. Anyway, the satellites don’t directly measure the temperatures, but they try to deduce them from the radiation it receives at specific wavelengths. The way to transform it into temperatures is unclear enough as to give temperature trends from UAH and RSS that differ in 0.035C per decade. Radiosondes on the other hand directly measure temperatures. The error because of homogeneization can be quite big, but the instrumental error is probably much smaller. I notice that you claim 2 main reasons to think of a bias in the radiosonde measures. One is solar warming, the other is homogeneization. About the sun, although it is true that measuring under the sun rises the measured temperature because of heating of the radiosonde itself, that only affects individual measures. It doesn’t affect the trends deduced from them, unless you can prove that the sun is affecting the radiosondes today in a different way that it was affecting them in the 80’s, in average. You would have to prove that radiosondes in the 80’s were more affected by the sun than today’s radiosondes. And about homogeneization, it only forces to use big error bars, but tells nothing about the error itself, or even the direction of the error. The error could be positive, negative or zero, small or big. It doesn’t prove an error in the direction that you want it to be. I also observe in your last graph that, in order to compare the allegedly corrected data to the models, you have only included one model in the graph. Which model is it and what is its surface temperatures prediction for 2050? You may already be preparing a post on this paper, but Allen and Sherwood (2008): “Warming maximum in the tropical upper troposphere deduced from thermal winds” is now available as an “advance online publication” in Nature Geoscience. How would you prove your point? You claim that fundamental technological changes in temperature sensors, telemetry and data processing methods, over 30 years of time, in all the world, did nothing to change the measurements also in this respect. That is rubbish. Solar heating is the major source of error, both in upper-air and in in-situ surface temperature measurements. Improvements in methods and equipment, processes of maintenance and calibration as well as a vastly better understanding of measurement methods have reduced the measurement errors by an order of magnitude over those years. From the climate change perspective it means that the warming is probably underestimated by about 0,2 degC. It is another matter (and a regrettable one) the the climate change community has to make do with historical data intended originally for other purposes, where the accuracy requirements have been much less stringent. The measurement systems were designed to meet the operational requirements of aviation meteorology and the daily weather forecasting mainly, with some cost vs. accuracy trade-offs. Homogeneity of data was the number one requirement, absolute acuracy was secondary. Smallish biases did not cause major problems for these dynamic meteorology applications. As another example, I find it peculiar that in the U.S. so much attention is paid to the so called Historical Climate network. The original requirement for those stations was to provide local information to support the farmers’ choice of crops to be grown, to the dimensioning of irrigation systems, the required height of dykes to prevent flooding, and such. All very important and worthy practical requirements, but definitely not demanding split degree absolute accuracy. Implementations were primarily by part-time personnel, more or less motivated to the task. A lot of people even at professorial level still seem to confuse this old-time climatology with something rather different: global climate change research looking for an order of magnitude more accuracy. Climate research is no more what it used to be. The major advantage now is that there exits a good theoretical understanding of climate and the forces behind it, as well a an array of different and mutually independent measuring technologies. No single system is critical any more. 1) Blue with dots: direct plot of column 3 of the data, “GLOBAL”. 2) Bold Dark Blue: averaging of the previous 3 years of the “GLOBAL” data. For that reason, the first 3 years are missing (not enough data to do averaging in the same conditions as the rest of the graph), but the first point plotted is the average of the true first three years of data. 3) Orange with dots: direct plot of column 6 of the data, “TRPC”. 4) Bold Red: averaging of the previous 3 years of the “TRPC” data. You can easily see that the GLOBAL data shows more warming than the TRPC data. This means that extratropical data must show more warming that the global data and, of course, that the tropical data. They are pretty much the same until 1999, but then they have started to diverge. Check the graph legend: “trends plotted since January 1982”. And check the look of the data between Jan 1980 and Jan 1982. They do the same to the RSS data. Both UAH and RSS anomalies were significantly higher than surface data between 1980 and 1982. Including those years would have ruined a good-enough fingerprint, I guess. Another question: Have the proposed homogeneization procedures been used also to see if radiosondes data in the remaining NH or SH need a correction as well? If not, why? If yes, is the result consistent with the satellite observations? This is old tired argument of “uncertainties”. RSS trend for 1979-2004 is outside 2 sd of model mean (see Douglas et al 2007, figure 1) (why do you use 1979-1999 period?). Your initial argument on this blog concernign Douglas et al 2007, was that very wide error bars of the models make them consistent with the observations. In this conversation you cite unceratinty of RSS data that are almost twice larger than trend (+-0,26), although Mears and Weinz (2005) state that error range of RSS T2LT is 0.09!!! Obviously, this time trick is to inflate error bars of data, not of models. Let’s take the oceans. First of all, after reading this post, think about how much less ocean data there is than atmospheric data. Far greater monitoring and sampling efforts are needed in the oceans – but again, this is something Pielke refuses to discuss. I am sure that Roger Pielke Sr. is a very nice person – but he’s wrong on the science, as well as on policy. It is also tiresome to see endless posts trying to redirect readers to his own website. The uncertainty in the data needs to be quantified, of course, but within these uncertainty brackets, a robust evaluation of global warming can be obtained. I mean, one could easily write a 20 page paper on the uncertainties in ocean heat and momentum measurements – it is a huge issue. A comprehensive dataset of historical ocean temperatures would be the place to look for warming- but that dataset wasn’t collected, and we don’t get to go back and do it again. This is a critical issue – indeed, probably the single most troubling aspect of the current U.S. government stance on global warming is the deliberate sabotage of data-gathering missions by politicians in the hire of the fossil fuel lobby. Muzzling government scientists pales in comparison. If we had launched Triana ten years ago, we’d have a ten year record of the net energy balance of the Earth, wouldn’t we? I’d like to see Roger Pielke Sr. say something about why he thought Triana was cancelled. That would be an interesting discussion. Gavin, I agree that “focussing on one record as if it’s perfect because it happens to suit your case is fundamentally unscientific”. But the people you talk about in your article are comparing their obtained corrected trends to satellite trends for verification. 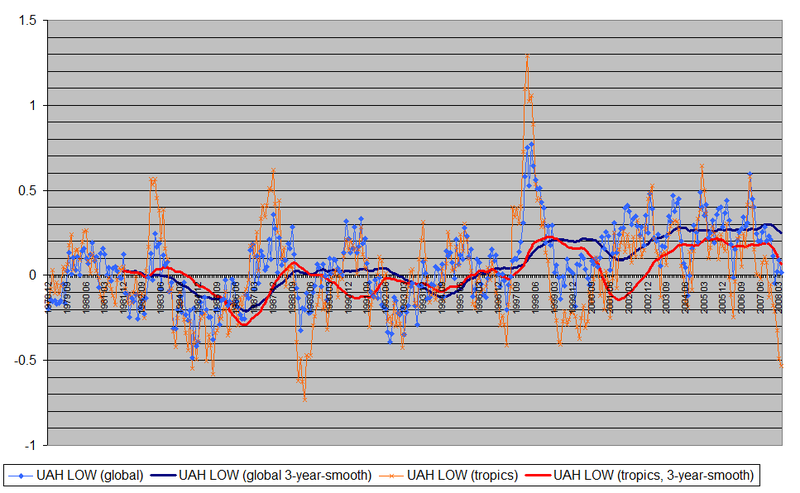 As far as I know, the 2 main sources of satellite data for temperatures in the lower troposphere are UAH and RSS, and they vastly differ in their trends in the tropical troposphere, with RSS’s trend being twice as warming as the UAH trend, although they show the same trends in the remaining troposphere, resulting in a Global difference of only 0.035C/d trend. Still, the tropical troposphere is the subject of these studies, and both sources differ in their trends by a full 0.1C/d in that region. I don’t understand. If there is more variability locally, then that means that using RSS or UAH data would be even more biasing. If the difference in the trends of both data is 0.1C/d, the local differences can be bigger than that. In fact, the differences change even seasonally, with divergences between UAH and RSS data in the tropics being maximum in the summer and minimum in winter (still big anyway). Also, Sherwood et all “avoid using the satellite data in the process, so that this can serve as a check on the final product”. That sounds to me like comparing final trends rather than local data. In the abstract of the paper, it reads: “Adjusted data from 5S to 20N continue to show relatively weak warming”. Which is true. Their homogeneization method mostly affects the radiosonde TLT readings in the northern hemisphere, extratropical. But in the tropics, the radiosondes data obstinately agrees with UAH TLT data far more than with RSS TLT data even after the homogeneization processes they propose. There are other interesting consecuences for the change they introduce with the correction of radiosonde data. The fact that radiosondes agree more both with RSS and UAH TLT data in the northern hemisphere after the correction, without reducing the level of agreement already existing with UAH in the tropics, means that the correction shows a curious effect that I had mentioned before: there is more warming in the extratropical northern hemisphere’s lower troposphere than in the tropics. But the models show that the tropospheric warming should be stronger in the tropics. As for the Channel 2 readings, which is middle-upper troposphere, the correction makes the radiosonde data disagree with satellite data in the NH more than it did before correction, while leaving tropical and SH readings almost untouched. Well, actually, the little adjustment that their homogeneization procedure provides for the tropics is towards cooling. Not too bad for skeptics, although it doesn’t make it look like it’s a good correction. So now that I read the article and fully understood it, I have nothing against its results. But I am not so sure that the result of their homogeneization procedure proves what you say it proves. How did you put Sherwood et al. 2008 in the same group as the others, if his adjustments don’t significantly affect the tropics, which keep showing a rather cooling trend? Even more, if their homogeneization procedure mostly affects the radiosondes data in the NH, where more measuring points exist and less of a homogeneization problem would be expected? I have one purely academic question relating procedures for showing graphs of data accross different latitudes, like the ones you copy from Sherwood’s paper showing trends for different latitudes and heigths in a colourful grid. Everywhere in literature I continue finding the same problem with this kind of graph, no matter which position is defended or what point the scientist is trying to make. The problem is that the horizontal axis of the graphic doesn’t linearly represent the surface areas covered, but the latitude numbers. Why is that chosen to be linear, if the data is more important the more area it covers, and therefore, it should be more illustrating to choose a linear representation of the area? In Sherwood’s graph, the area of the squares in the grid don’t correctly represent the volume of the atmosphere covered by it, because it gives, for example, the same width to squares in latitudes between N70 and N80 degrees than to squares between 0 and N10. The truth, however, is that the surface area corresponding to N0-N10 latitudes is more than three times bigger than the area between N70-N80. Same goes for the atmospheric volume. Why is this done in this way, with linear increase of latitude numbers instead of linear relationship with the areas covered? Is it because of some kind of tradition with showing the graphs in this way, or because nobody has ever thought about doing it different, or both? What Gavin is trying to say is that the real world is not like a Mercator projection. The distance between points at the same longitude deceases as the latitude increases. However, what he is missing is that even when seven of the top scientists try to explain why the models and why the data does not agree with the theory, they still cannot come to firm conclusion that the data is wrong! The obvious answer is that the models are wong! “The Mercator projection is a cylindrical map projection presented by the Flemish geographer and cartographer Gerardus Mercator, in 1569.” Wikipedia. Whether it is Mercator or cylindrical is irrelevant to the fact that the data and the theory conflict. No matter how many scientists Gavin can produce, none of them can prove that the models are correct! What I find irriatating is that the more papers that Gavin comes up with which do not prove the models agree with the data, the more he is convinced that the models are correct! It is true that most data is attached to latitude, and that most graphics programs plot things linearly. But it is also true that transforming the latitude data of the individual radiosondes so that they are organised into surface-equivalent data groups is simple enough to be done with a simple excel sheet in less than 5 minutes, and once you have them correctly grouped and averaged, a linear plot will do the desired job perfectly well. So I wouldn’t really say that the other option is easier. There’s a 5-20 minutes diference (depending on skill) compared to the months that analizing the data and publishing the paper take. Just a general observation in regards to the oceanic heat content value in determining global warming. We will need to pay particular attention to SeaWiffs as to estimating the turbidity at depth. I have been observing studies that point to a cooling of the regions below highly turbid regions and a rise in the 20 Deg C. isothermic layer when there is high surface turbidity. The complication is that the heat content does not stay concentrated in the shallows above highly turbid regions. When I look at the Argo and the PIRATA data there does not appear to be significant SST build up except in a small area near 4 Deg N 0 Deg W. When I look at the SeaWiffs data I have wide spread, shallow turbidity in the region with a concentration near the former Ivory Coast. In short, simple SSTs do not tell us enough when trying to analyze energy content. Likewise, isothermic depths may not be representative as well. When I add in oceanic thermal turn over and wind speed variations resulting in pile-ups down wind of long fetches with narrow outflow streams or currents rather then a wide spread shield seems to be of concern in establishing the heat content potential using remote and SST observations. For me these observations leave the question of how does the community expect to establish the heat content? Are they expecting to read both the intensity as well as the frequency spectrum? Are all the Argo units going to be retro fitted with turbidity detectors? If anyone has any insights as to how the models will represent the combination of measures I would be interested in reviewing the planned protocols to see what will be attempted to address the issues that have recently started coming to light. According to UAH data, the tropical lower tropospheric temperature anomaly in May has been -0.579ºK, the lowest anomaly of any month since March 1989, and an absolute low record for the month of May since satellite measures are used.